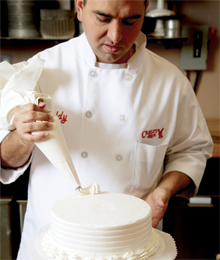 Cake Boss: Bartolo “Buddy” Valastro Jr. If there’s one thing fans of the hit reality TV show Cake Boss will attest to, it’s that there are cakes, and then there are Cake Boss cakes. The difference? A Cake Boss cake is layered, shaped and coloured with such whimsical novelty they’re almost too pretty to cut – but too delicious to resist.